Q. You recently sent a sample of Tergazyme detergent for a tough cleaning challenge and it worked better than anything we had previously tried. I realize this must be due to the enzyme component. What information can you provide me on how enzyme detergents work, so I can share it with our decision makers / executives who want to better understand why this detergent got such different results? A. Tergazyme® Enzyme-Active Powdered Detergent is an extremely potent cleaner, ideal for cleaning proteins, DNA, RNA, biofilms, proteinaceous soils, tissue, blood and body fluids through manual or ultrasonic cleaning. This concentrated, anionic detergent is used in manufacturing, lab, healthcare and cleanroom environments. Its protease enzymes remove proteins from glassware, metals, plastic, ceramic, porcelain, rubber and fiberglass with no residue. 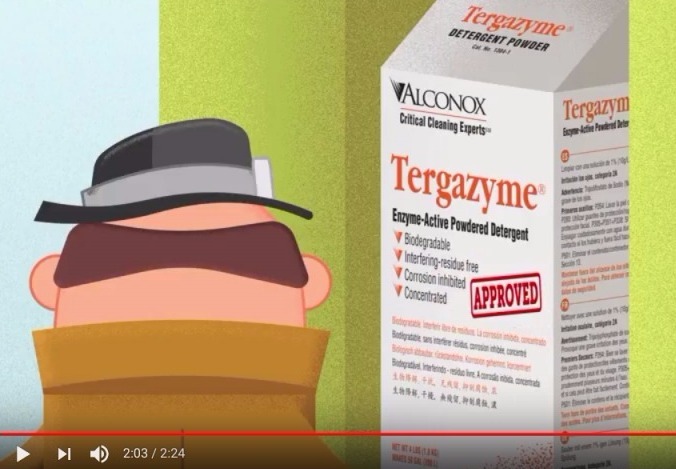 This video explains how Tergazyme detergent’s protease enzymes act to break down proteins, rinse completely away and leave no interfering residues. Tergazyme detergent is a corrosion inhibited formulation that can be used on soft metals such as copper, aluminum, zinc and magnesium when rinsed promptly. It is commonly used to clean/reprocess medical devices, hospital instruments, dairy equipment, laboratory ware, reverse osmosis and ultrafiltration membranes and units, sampling apparatus, pharmaceutical and cosmetics manufacturing equipment, tubing, pipes, optical parts, process equipment, industrial parts, desalination plants, tanks and reactors. Tergazyme detergent passes inhibitory residue test for water analysis and is FDA certified. Happy to discuss your particular proteinaceous cleaning challenge any time! To request Tergazyme detergent or another Alconox, Inc. product for free, please complete the questionnaire at Get Sample. For more information about any one of our Alconox, Inc. detergents, consult the technical bulletin for each product. Or click here to access each of our detergent’s Safety Data Sheets.